Knowledge of this structure, called the cytoplasmic tail of gp41 protein, will help researchers further understand how the virus infects human cells and how progeny viruses are assembled and released from infected cells. The cytoplasmic tail appears to play a key role in virus assembly to help incorporate the envelope spike structures into the surface of viral particles. "If we are able to inhibit incorporation of the envelope protein, we inhibit viral replication," Saad said. "This would disarm the virus and prevent disease. The cytoplasmic tail is a critical component of infectivity." The structure of the cytoplasmic tail of gp41 was a tremendously difficult task to solve, says Saad, an associate professor of microbiology at UAB. "It was the most challenging project I have encountered in the past 20 years. Many times I was about to quit, but I have a very persistent lab group." Saad knows of many other research groups that were unable to determine the molecular structure. One problem for Saad and his UAB colleagues came as they tried to express the cytoplasmic tail of gp41 in growing E. coli cells. Instead of intact product, a bacterial enzyme was cutting the protein during protein expression. "We have never seen this for any other protein," Saad said. The researchers found that they had to limit protein expression to just two hours. Even then, 70 percent of the cytoplasmic tail was cut and only 30 percent was left intact. It took over two years and efforts with 100 different conditions to get good product, Saad says. "Now we can make it in two days." The cut turned out to be useful. One piece was soluble, and the Saad group was able to examine its structure using nuclear magnetic resonance, or NMR. The other piece was insoluble, so the researchers had to use a solution of micelles—dispersed lipid or detergent-like aggregates in a solution—to let the insoluble piece form its structure within a membrane-like environment. Like the growth conditions, the researchers needed many trials to find proper membrane conditions. A micelle solution is somewhat similar to vinegar and oil after one has shaken it hard to disperse tiny oil droplets throughout the dressing. Again, NMR was used to solve the insoluble structure while incorporated into micelles. When the Saad group put molecules of the intact, full-length cytoplasmic tail of gp41 into the micelle solution, they found that the structures of each of the pieces were maintained in the intact structure. They found that the N-terminal end of the cytoplasmic tail of gp41, measuring 45 amino acid residues, lacked a regular secondary structure and was not associated with the membrane, which wraps around an HIV-1 viral particle like the leather cover of a baseball. The C-terminal end of the cytoplasmic tail of gp41, measuring 105 amino acid residues, was tightly associated to the membrane and had three alpha-helixes with portions that were hydrophobic and portions that were hydrophilic. 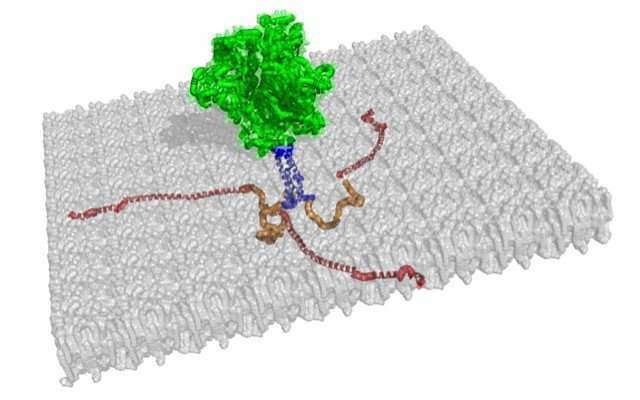 The UAB group also showed the preferred topology of the cytoplasmic tail when bound to the membrane. Saad says the structure opens up whole new areas of research: How the cytoplasmic tail stabilizes the envelope protein structure, how it affects membrane mobility of the envelope protein structure, and how it helps coordinate membrane-binding and the association of 2,000 HIV-1 Gag polyproteins underneath the membrane surface. The Gag polyproteins are later cut inside the maturing virus to form multiple smaller matrix, capsid and nucleocapsid proteins that produce the condensed viral core. Saad says knowledge of the gp41 cytoplasmic tail structure will also open comparative studies of 10 different retroviruses that have similar tails to learn why some tails are shorter and some tails are longer. "The cytoplasmic tail of gp41 has been of interest for a long time, and nobody understands how it functions in infection or how it helps incorporate the envelope protein into the membrane," Saad said.